UPDATE: I am leaving tonight to get down to London and then Greenbelt Festival in Cheltenham. I will be on a BLOG FAST for the next 4 days while I am camping in my tent with thousands of other happy campers. Looking for me? I should be pitching my tent with the large group of Germans from Kubik (where i preached earlier this year) and the Doxology team. 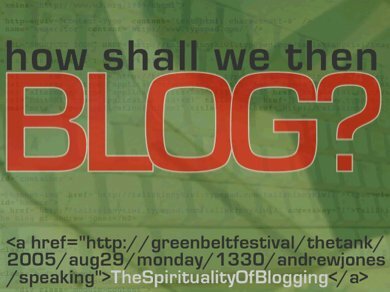 – Greenbelt attenders are encouraged to place a tag on their blogs and share photos using Flikr for a Greenbelt montage. Details here. – Best teaching at Greenbelt this year (apart from my seminar “The Spirituality of Blogging” at the Greenbelt TANK – ha ha) will be to hear Karen Armstrong speak on whatever she will speak about. I have two of her books at home – she is really something! She is my only “MUST HEAR” for Greenbelt this year. – Will there be another roundtable for emerging church like last year’s Epicentre Roundtable? NO – nothing formal planned this year but there are lots of opportunities to do this inside the program. If you know of a time and place where something is happening, please leave a comment below. Greenbelt Festival (Cheltenham, UK) have me speaking on Monday 29th August in The Tank, the official hangout space of the Geeks. The title of my talk is “The Spirituality of Blogging”. Some of you heard me speak last year on “Forward Slash” which was more of an intro to the values of new media. This one will go further in exploring spirituality in and through hypertext, internet, and of course, blogging. I assume it will be recorded, since they did it last year and made it available through their web-shop. Pre-reading? I recommend downloading Tim Bednar’s “We Know More Than Our Pastors“. But I also hope to meet up with more than geeks. It will be good to see old friends (all my friends are now old) and I have a desire to meet up with people who have just recently started up an alternative model of church. Let me know if that is you. ok, that gif is awesome. love the href format. talk about nailing your core audience; very gearhead, very nice. i just did that this morning – the html is from the source code of this blog (of course) and you can faintly see my Mac Mini. i also just removed the last months header, which was an image i took of my actual logic board from my ibook. hope to catch you talk at Greenbelt. I think it would be interesting to have some commentary on incarnational vs attractional approaches to blogging. Should we assume blogging is any more missional than dusty churches simply because it’s high tech? The Emergent-No blog should put that one to bed. But lets dig deeper. If we only blog with fellow EC people and only using EC insider language are we any less insular than our RL counterparts? Obviously I believe blogging can be incarnational or I wouldn’t be doing it, but is it intrinsically so? Who am I kidding? This is how Canada lost hal its navy in that last overseas military endeavour. Alas, wish I could be there! btw – where you at Converse in Sydney when i spoke there 3 years ago? as for EC and non-EC, I really dont see the dividing line as clearly as you do. I dont call myself an EC blogger. I am just a blogger. And people involved in EC churches and non-EC churches come here – and i speak in EC environments and non-Ec environments. I feel that the values and ethics of blogging are common among all those seeking to communicate our lives and stories, regardless of background. Although it is true that many in the emerging culture are very much at home with new media and the internet and the potential for division (slow church and fast church, old-media teachers and new-media teachers, fast countries and slow/unconnected countries) could easily happen. Maybe we need to watch out for that. That is a good warning! I see blogging as a window to our lives – much as Daniel had a window when he was praying (got him into trouble, though) – windows let people look inside and see what we are doing, thinking, reading, etc but they do not makes a person’s life more incarnational or missional. and my neighbours who come over here for a drink have no idea about blogging and really dont want to know – being incarnational to them will not involve blogging. But for others it might. At the ‘Between the Lines’ venue, I’ll be part of a panel discussion about blogs (with Nick Page and who knows who else — maybe you?) on Sunday 6pm. I hope you get REALLY REAL ie allow the REAL SELVES to surface. After all thats whats blogging is about. The only difference is you can link to the few or the many and create community out of your sorrows, pains, journey interest. Thats my ONLY anxiety. I think you’re topic is spot on and I might attend the Seminar and or spend out a few pounds in hearing you expound on CD. See you there! Shall have to check out your seminar; sounds good!